Contact Arizona Wings N' Stings today at 602-942-6550 - 480-969-2337 to see about scheduling an inspection of your property and see how we can help you stop all the noise and mess as well as protecting you, your family, employees and customers from possible slip & fall dangers or health hazards associated with pigeons and pest birds that are roosting or nesting in and around your home or business. 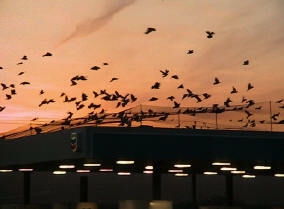 A gas station canopy pose's a real problem for the station owner when pigeons start to nest on them. 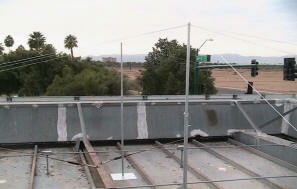 It does not take many years for a flock of pigeons to ruin the gutters and metal of a $ 20,000.00 canopy. 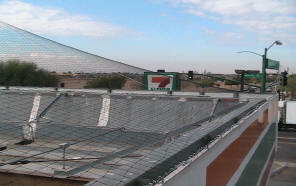 Gas Canopies provide a great observation point for pigeons, they like to sit along the canopy edges and survey the area. Canopies also provide lots of protected nesting sites inside the canopy gutter areas and just out in the open. On the gas canopy flat metal roof areas, pigeon feces and nests will clog the drains and eat away at the light weight metal canopy itself, anyone that has been around a gas canopy after it rains and where a lot of pigeons have been nesting has probably seen the brown stuff running along the ceiling and down the sides of the metal joints or worst yet smelled the odor the canopy emits for several days after the rain - not very pleasant. Gas canopy outside view metal siding can get covered with pigeons feces that will run down the canopy sides and even landing on the ground creating an unappealing image to customers pulling in to the station and this also creates slip and fall hazards on the ground for customers filling up with gas. 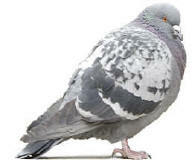 If you see pigeons roosting along the top edges of you gas station canopy they most likely are not just passing by they live there and you have a bird problem - it will not go away it will only get worst as time goes on and more baby pigeons are born and that will cost even more to clean and fix. As an example: One of the 110' x 45' canopies we cleaned took 14 men 1 1/2 days and filled a 40 yard dumpster that we filed with 626 full size 55 gallon trash bags of pigeon waste, it weighted over 10 tons, what's worst is that the company had us clean the canopy 2 years earlier and we took a little more than this amount off the first time. 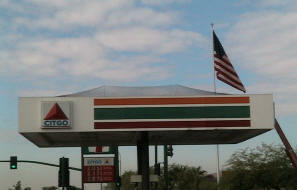 Pigeons just love gas canopies, even small units like this 25' x 25' can have 60 - 100 pigeons living on top of it. The pigeon feces, eggs and dead birds on this canopy were 6" to 12" deep, the dry weight when removed was over a ton in weight. All the gutters were clogged, so when it rained the weight was probably 2x the dry weight which could lead to rusting of the metal canopy or worst yet collapse of the structure. 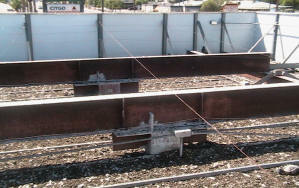 Support poles and a cable system are used to help hold up the exclusion netting. 2" Netting is installed over the cable support system and hog ringed to hold the net in place. Net is attached to the edges of the canopy and pulled tight. 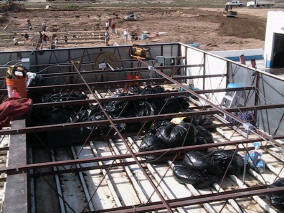 View from the ground is only slightly visible, but what is worst ? all that pigeons feces on the canopy and the smell when it rains or the view of bird net on the canopy keeping out the pigeons. Netting can be installed several different way, with a pitch as seen in the 7/11 canopy or we can install the netting straight across so that it can't be seen from the ground. 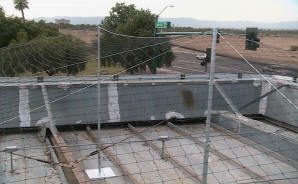 We prefer to install the netting with a pitch if you have any large group of pigeons living on the gas canopy because once the canopy is netted off the pigeons will still hang around for a while and the weight of several dozen or 100 pigeons will stress the net to the breaking point if the pigeons stay too long as seen in the below examples. If you have a lot of pigeons on your gas canopy it may be best to use 1 1/8" netting since it's stronger than the normal 2" pigeon netting against so much pigeon weight. 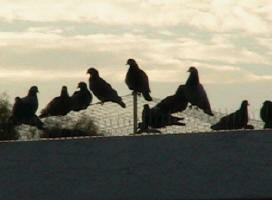 Live catch trapping to reduce the main pigeon population is one of the best way to stop this problem. 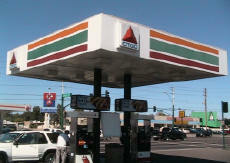 Contact us for all your gas canopy bird control needs, we have the experience and know how to do the job. Call Arizona Wings N' Stings for all your bird control problems.